On April 29,1987 2 PAF F-16s were scambled to intercept a strike package on a mission to interdict Pakistan supported Mujahideen (Islamic Mercenary) operations that were launched against the Soviet troops and the pro-Soviet afganistan government. The battle resulted in a F-16 kill for Pakistan and the official explanation has been that the pilot (who ejected safely) was shot down by his own wingman. 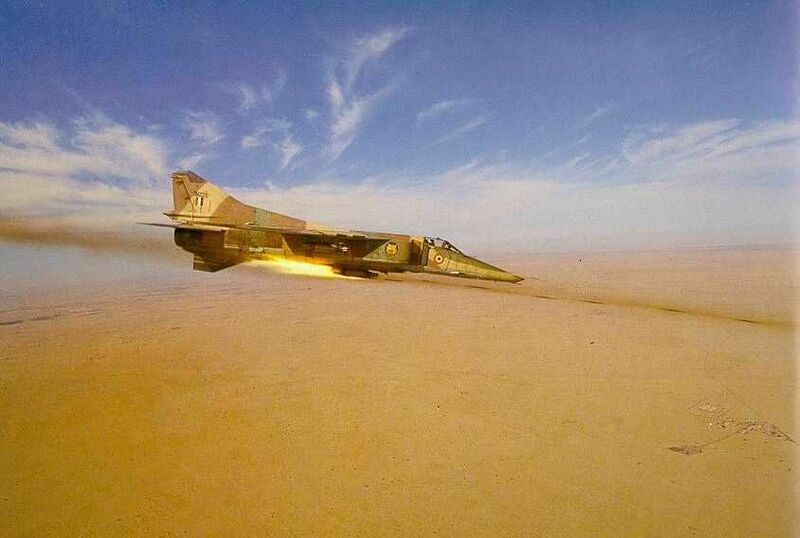 On April 29,1987, L/C Pochitalkin led a flight of four MiG-23s to mine mountain path under Mujahedeen control in the Djavara region,to the south of Host. These routes were used to supply weapons and ammunition to the dykhi(ghosts-Russian translation of Farsi 'dyshman' meaning bandit) who blockaded the town. The strikes delivered 1,100lb(500 kg) bombs onto the highland passes effectively blocking the way for the arms caravans. 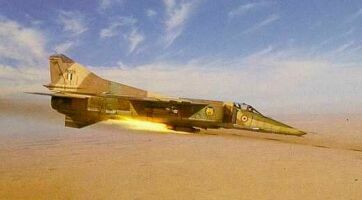 The MiG-23s were usually armed with up to four KMGU (Ronteyner Malogabaritnyh Gruzov - small weapon container) each carrying 24 anti-personal mines. At the place where the Griffons would have to 'work' (meaning 'to execute an order' in the Russian Air Force), Mujahedeen had many and varied air defence weapons including Chinese built 12.7mm DShK machine guns, and 20mm Oerlicon guns with a range of 6600 ft. And from 1986, Dykhi used General Dynamics' Stinger shoulder-mounted surface-to-air missile (SAM), with a range of 11,550 ft to defend thier main bases. These would have to be destroyed and the flight group leader decided upon the following mission: fly to the target at 26,400 ft, and just before reaching it, dive to 1,320 ft and toss the bombs while climbing, then enter a 90 degree left rolling climb to 23,100 ft. Such tactics would avoid entering Mujahedeen air defence space. Early on the morning of April 29, four MiG-23s got airborne from Bagram. Meteorological conditions were difficult with multiple cloud layers, known as puff pie, starting at 9,900 ft up to 33,000 ft. The monotonous highland terrain also complicated orientation, but L/C Pochitalkin was an experienced pilot - he regularily led four to eight Griffons during combat missions. Just before the target area, he managed to find his bearings by the little town of Tani, to the south of Host. The three MiGs folloed him closely. The war had provided pilots with the opportunity to gain considerable experience of formation flying, so they are really tight. Just before the taget, the MiGs descended, then during the steep climb released their bombs and, keeping close formation, climbed left into a combat turn leaving the battle course at 90 to 100 degrees. Having reached 21,450 ft, the flight leader lokked back, and between the clouds saw a flying torch-like flame. Thingking it could be a plane from his group, L/C Pochitalkin turned his MiG aroung and called to his wingman. All three pilots responded immediately that they were OK. The flight leader reported to base that he had seen a burning aircraft, and Major Osipenko, the regiment's intelligence officer, flying in the trailing aircraft, confirmed this. Then L/C Pochitalkin banked left vectoring onto the torch. Suddenly, all the MiG pilots saw an F-16 Fighting Falcon appear from heavy clouds at 13,200 ft, it made a steep bank round its burning co-partner, engaged the afterburner, and disappeared into the clouds, heading for Pakistan territory. On the way home, the airwaves were alive with the questions about the incident to the flight leader. After landing at Bagram, L/C Pocjitalkin told that his group had been attacked by a pair of Paistan Air Force F-16s and one F-16 was shot down. Later this report was confirmed by Had, Afghanistan intelligence, an offshoot of the Soviet KGB (and a very effective servvice). It reported that the F-16 pilot ejected safely, landing in a rebel controlled region - he was transferred to Pakistan that night. Later, wreckage from the Falcon was also transferred. Throughout the analysis of the incident, one major question remained unanswered - how was the F-16 was shot down, when the Griffons were not armed with missles. Three possiblities were considered by the committee. The first, and the most likely, was that the F-16 met the rain of bomb mines on its rising trajectory and blew up. 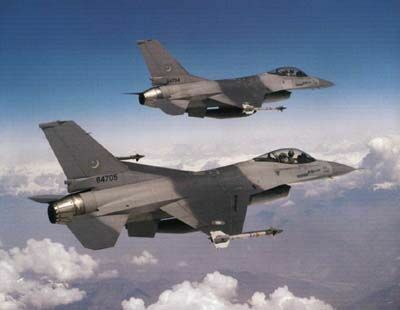 The Falcons probably took off from Kamra Air Base, near Miranshah. Kamra is situated so close to the Afghan border that the F-16 could launch their Sidewinders immediately after getting airborne. PAF pilots intended to intercept Soviet fighters at high altitudes, assuming that they would be dive bombing, but on that day the Griffons'worked' on the climb, and steeply descended before the attack. At that moment, the F-16 could have slipped forward and become caught up in the 'cloud' of bombs. The second version suggested that during pursuit, the F-16 came upon the climbing MiGs, and trying to avoid them, the Pakistan pilot jerked the plane into a sharp bank and exceeded the maximum g-load. The final thoery was that the Falcon could have been shot down by his wingman. Intercepting th MiGs from the aft hemisphere, the F-16s tracked them on their radar up to the point where they released their bombs. But when the close formation Griffons carried out drastic flak evasion manoeuvers, the F-16s had to carry out the turn and the wingman may have hurriedly fired his Sidewinders accidently hitting his leader.